The power of a photograph! Not a dream today, but a moment of reality. This is another image from my inspiration blog, may it rest in peace. letting some people see them for the first time. There are so many things that go through my head when I see this sign. but some of the others. checking for those awful others. I don't understand, but I never pursue it. another stack with a birdcage way over there. and I go on my way. This sign is from Macy's. No books with birdcages there. in this day of cellphone cameras. 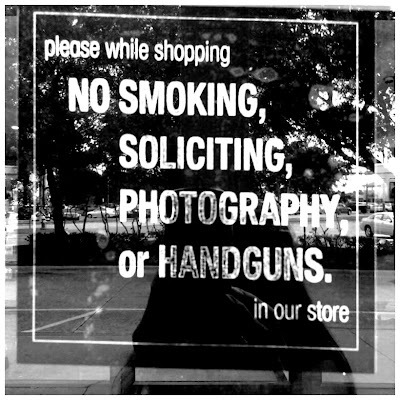 So rifles, sawed-off shotguns, and submachine guns (not to mention grenades) are welcome at Macy's? Well hot damn! But who'll be around to photograph all the mangled mannekins? LOL. Yes, well that means automatic weapons are OK, then! And knives? Bombs? I'll stop here. Thank God banjos can still be freely plucked!